– for extended sequences of sci-fi violence and action. Plot SummaryA rogue team of rebels make a daring attempt to steal the Death Star schematics from The Empire in hopes to be able to destroy before it becomes fully operational. Film Review With Disney’s acquisition of Lucasfilm and the Star Wars franchise came the promise of many more Star Wars adventures headed our way. The first installment came last year with Star Wars: The Force Awakens, AKA Episode VII, and this year marks the very first ever feature-length, live action Star Wars film that isn’t directly part of the Episode saga (We won’t count 2008’s Star Wars: The Clone Wars, because not only was it animated, but it was essentially a 3-episode pilot for the TV series). Rogue One: A Star Wars Story precedes the events of the very first film, 1977’s Star Wars (AKA Episode IV: A New Hope). Rogue One centers on a new cast of characters who unite in the attempt to steal the Death Star schematics in an effort to bring down The Empire’s super weapon. Gareth Edwards, who directed 2014’s Godzilla, takes the reins to deliver a film that brings fans more of what they love about the series while expanding on the world around the original trilogies. Rogue One deviates from the norm from the start, forsaking the customary opening crawl that recaps the latest events in the saga and giving us a legitimate prologue (flashback) instead. This introduces us right away to the Erso family, lead by Galen Erso who was forced to help The Empire design their super weapon, the Death Star. Edwards makes great use of close-ups and artsy camera angles to show us a much different side of Star Wars. In the first third of the movie, the pacing is slower, the action less frequent, and the landscapes of several new planets feels more tangible than what we’ve grown accustomed to, particularly in the prequels. However, it’s this different approach that makes one feel like this is anything but Star Wars. I had to reassure myself that this change is good and not at all unwarranted. Star Wars should have room enough to not need to always “feel” like Star Wars, especially if it’s veering away from the Skywalker family centric-storytelling. Still, roughly midway through the film (perhaps sooner), Rogue One really begins to resemble a Star Wars adventure, and Edwards’ attention to detail is nothing short of glorious. Fans are given plenty of familiar nuggets to warm their hearts while offering a fair enough amount of new content to keep the movie feeling fresh. The new characters are wonderful additions to the Star Wars world. While many valid arguments can be made to The Force Awakens being a thinly veiled remake of A New Hope, with several characters filling in for original trilogy characters, Rogue One gives us new characters and personalities. Jyn Erso is Galen’s daughter who encourages the rogue Rebel team to go on their treacherous mission to swipe the Death Star schematics, and Felicity Jones plays her very well. Cassian Andor is not your usual hero, a really rough-around-the-edges Rebel who isn’t afraid to compromise his morality for the Rebel cause. Diego Luna is excellent as Cassian and delivers a well-rounded performance. Comedic actor Alan Tudyk once again voices a robot (he was the central character, Sonny, in 2004’s I, Robot), bringing the scene-stealing K-2SO to life in a big way. There isn’t much comedy in Rogue One, but K-2SO brings most of the laughs (but not in a cheesy way). It’s a much needed dose of lightness too, because the weighty story does shroud the story in darkness a bit. Edwards isn’t afraid to chase after capturing the “War” part of the saga’s name. Other standout characters include Wen Jiang’s warrior Baze Malbus, Donnie Yen’s Force-sensitive fanatic Chirrut Îmwe, and Riz Ahmed’s former Imperial pilot, Bodhi Rook. It’s such a wonderful ragtag bunch of renegades and they play well together. Ben Mendelsohn serves as the film’s central villain, a new character named Orson Krennic. He and Galen have a history together as he’s tasked to oversee the building of the Death Star. He’s not a super developed character, but he’s a strong actor who gets the job done here. The only character in the whole film I wasn’t too thrilled with was Forest Whitaker’s Saw Gerrera. Aside from the fact that Saw is the very first Star Wars character to transition from the animated series Clone Wars into a live action Star Wars film, Whitaker’s portrayal is over-the-top and anything but subtle. There’s so much to talk about with Rogue One: A Star Wars Story, but it’s tough to discuss without spoilers. However, I won’t spoil anything here for you. There are some cameos and plot aspects that explain things for the movies that follow (but also, sadly, kind of create a plot hole for the transition of Rogue One into A New Hope). But man, there’s just so much to love about Rogue One. Thematically speaking, there’s a wonderful theme of sacrifice and selflessness that really adds to the characters and makes the film all that more exciting. Also, Yen’s Chirrut Îmwe is such a unique new kind of Force enthusiast. I loved his scenes, especially with his buddy, Malbus. And those space battles! We get to see some familiar faces during some of the climactic action that serve as a brilliant precursor to the fight at the Death Star in the following film. The effects are also stupendous. While the prequels were overly rich with color and shiny CG effects, Edwards grounds Rogue One believably in the same universe as the original trilogy. The starships’ CG is barely noticeable (so much so that any blatantly CG characters do rather stand out), and every set piece and on-location filming is especially appreciated. This film very much feels like a loving tribute to what fans love so much about Star Wars. Sadly, this isn’t a movie you’d want to take the younger kids too, most likely. It’s very violent, and more so than usual for a Star Wars adventure. I’d say it may even be a hard PG-13 — at least on the Star Wars scale. It’s not nearly as dark or disturbing as Revenge of the Sith, but there are big battles between Rebels and stormtroopers, Krennic executes Imperial characters with laser rifles, a Rebel shoots an informant unexpectedly in cold blood, a child watches a parent be shot to death, and we see some other dramatic deaths. In all honestly, I processed the loss of Han Solo in The Force Awakens far more heavily than any grim aspects of Rogue One, but there’s definitely more loss in this movie. However, in all of the violence in Rogue One, it’s never graphic. There’s very little blood, although we do see some on some characters’ faces during and after battles, but it’s very little. Aside from that, there’s no language, substance abuse, or sexual content. Rogue One: A Star Wars Story is a fantastic new chapter in the Star Wars world. I’m interested to see how it holds up with repeat viewings over time (after all, I think I enjoyed the prequels at first viewing; these days, their flaws are too glaring to ignore), but my first impression is highly positive. If you love Star Wars, you’ll probably find a lot to love about Rogue One. It’s quite a ride! 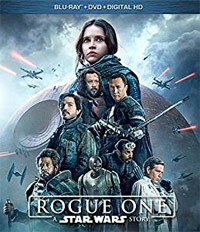 Blu-Ray Special Features ReviewRogue One: A Star Wars Story is available on single-disc DVD or in 2-disc Blu-Ray/DVD combo pack with a bonus Digital HD copy. While it might be tricky to find a 3D copy, it seems Target and Best Buy both have exclusive packages with 3D Blu-Ray copies of the film, along with the 2D Blu-Ray and DVD discs. (Best Buy’s is a special steelbook release. )Watching the movie on Blu-Ray was my fourth time seeing it, and I’ve enjoyed this movie more with each viewing. It’s such a great entry into the Star Wars world that captures what we’ve loved about the series in the past while giving it a fresh view. One of our viewings in the theater was in IMAX 3D and it was pretty awesome. I haven’t seen the 3D Blu-Ray transfer yet, but I do look forward to eventually checking that out as well. I just love this movie! The Stories (1:08:58) is an hour-long feature that is split up into 10 chapters with a Play All function. It opens with Lucasfilm’s John Knoll talking about how, after Disney bought Lucasfilm and planned to do a series of new Star Wars spin-off movies, he had pitched the idea of the rebels who had stolen the Death Star plans. We also hear about how director Gareth Edwards had come to be part of the production as well as his personal history as a huge fan of Star Wars. The second chapter, “Jyn the Rebel,” is all about her character, Felicity Jones playing the part, her relationship with her father Galen, and what her character is like. Gareth also talks about how physically demanding and exhausting her role was. “Cassian the Spy” focuses on Cassian Andor and how he’s not a typical hero. 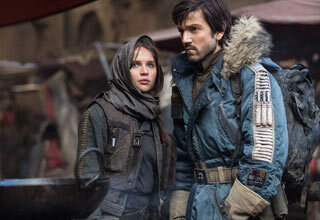 We also hear from Diego Luna and see some great on-set footage from filming. “K-2SO the Droid” talks about him being the “anti-C3PO.” Comedic actor Alan Tudyk talks about him and what it was like to play the part. He actually had acted out the character in person in gray motion-capture “PJs” and we see some really awesome behind the scenes moments involving him (including either walking around on stilts or with a backpack with K2 head on it to give co-stars an eyeline). “Baze & Chirrut: Guardians of the Whills” is about how two of the biggest stars in China, Donnie Yen and Wen Jiang, took these roles in Star Wars because their kids encouraged them to. This segment also talks a little about The Whills and how The Force dwells in these guys. “Bodhi and Saw: The Pilot and the Revolutionary” is another interesting segment that talks about how Riz Ahmed had kept sending tons of different takes on the character to Gareth for auditions. It then talks about how the character of Saw debuted in The Clone Wars cartoon TV show and he had been George Lucas’s original idea. “The Empire” shows us the return of Tarkin and Vader and the introduction of Director Krennic. It also touches on the motion-capture they had to do to bring Tarkin back to life. “Visions of Hope: The Look of Rogue One” is more about the design of the look of this side-story in the Skywalker saga. They deliberately were chasing after Ralph McQuarrie’s art style during the design process, which inspired the original trilogy. They even built the rebel base set in the same hangar used in A New Hope. “The Princess & The Governor” is all about the technology used to resurrect Peter Cushing’s likeness for Tarkin and to digitally create a young Princess Leia again. It’s neat to see how this controversial technology came about. “Epilogue: The Story Continues” gives us a glimpse into the film’s Hollywood premiere. Overall, this is a wonderful feature about the film and the history of Star Wars, further proving Rogue One is an affectionate homage to the original Star Wars film and made for fans by fans. Rogue Connections (4:31) – In classic Disney fashion, there’s a featurette about Easter eggs included. They briefly touch on a tank from Episode 3 being shown as a prisoner transport, Doctor Evazan and Ponda Baba bumping into the rebels in the street, the Empire Strikes Back spy droid making an appearance, the Dejarik game, a mention of Rebels General Syndulla, cameos by the film’s producer and writer, the ill-fated original Red 5, Gareth’s cameo as a rebel on Tantiv IV, etc. Amazingly enough, though, they didn’t point out the other Rebels cameos, like Chopper in the background at the rebel base or their ship The Ghost sitting at the base and later flying around the battle above Scarif (And they’re definitely there!). All in all, it’s a fun little featurette. Blood/Gore: We see some blood on Bodhi’s head while he’s being interrogated by Saw and for a little bit afterwards; A character has some blood on their hands and head after an explosion; Another character has some blood on their face after being wounded; Some characters have small amounts of blood on their faces during and after battle; A man who’s survived years of battle has two mechanical legs. Violence: A whole lot of action and war sci-fi violence. A woman is shot down by Death Troopers, but manages to shoot a man in the shoulder first; We see massive explosions that wipe out a couple cities; A man is strapped to a chair while a tentacled creature leeches information from him; A Rebel shoots a stormtrooper and, after his informant says he won’t be able to escape them, he shoots the informant in the back; A group of engineers are executed by laser fire; A tank in city streets is bombed and we see a fire fight between Rebels and Imperials in the street. Jyn dives into the line of fire to save a little girl in the street; A man with a staff beats up a large group of stormtroopers; A man with a laser machine gun mows down stormtroopers in a couple scenes; A droid is shot and destroyed; A droid is shot multiple times and falls over, destroyed; An explosion throws a man and he dies in the arms of a comrade; Man explosions are shown, throwing stormtroopers into the air; We see many Rebel soldiers die in battle; A big space battle shows many Rebel ships and Imperial ships exploding, colliding, etc; Some Rebel ships crash into a force field in space; A man is shot and falls over, injured; Another man is gunned down and dies; A man is in a ship that gets blown up by Imperials; A man force-chokes another man, then releases him; We see a large explosive wave engulfing a couple people; SPOILER: A character with a lightsaber massacres a room of people as they shoot lasers at them. They also bounce some of the lasers off their saber at them, killing them. – And lots of other sci-fi action violence.